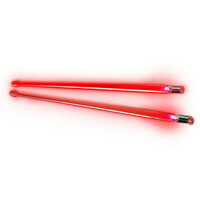 The Firestix Light-Up Drumsticks are made from heavy duty solid clear plastic (Lexan) and light up on impact to create a dramatic light show effect on stage. Great for drum solos these Red drumsticks are a fantastic statement piece and will definitely grab attention. The screw-in end caps mean battery replacement is quick and easy too.